Working Dog Holiday ends today. I will carry the dog downstairs one more time. And then off to the airport, where I will give dog and car to a friend who will drive both of them back to the land of ice and snow, while I begin two and a half weeks of perambulation in support of the Coraline movie. I don't know if you've heard this directly, but I know two people who, while being Gaiman fans, said independently of each other said, "I'm sick of this Coraline hype. Enough already." While I'm eager to see the picture, I can understand what they perceive as advertising bombardments, be it billboards, web ads, commercials and so on. I'm sure you would like as many people as possible to see the movie, do you think it's been "a bit much" with all the Coraline stuff out there? Not really. It's a film without a big name star, handmade in Portland by a first time studio: it's not a film that the world is holding its breath for -- mostly, the world doesn't really even know it exists. The filmmakers have one crack at getting people in to see it on its first week of release, and only one, because, while it will undoubtedly go on to live forever on DVD format (and whatever comes after that), possibly even go on to Nightmare Before Christmas-like longevity, the perception of whether it was a success or a failure is mostly all about how it does when it goes out there on Feb 6th. I'm proud of what Henry and his astonishing team did, and want as many people to see it as possible. The reviews will help, but I'm not sure that reviews make as big a difference as simply advertising and letting people know something's out there. (Princess Mononoke was an eye-opener for me in that regard. In its first year it had the top positive review score on Rotten Tomatoes. Didn't get people in to see it.) Word of mouth and "buzz" are difficult, probably impossible to manipulate. So you advertise, and you put the word out to where people who see films congregate. I was sent the "tracking" for the film the other day, where the various studios and agencies find out what groups are planning right now to go and see what films, and if your friends are males under the age of 25, then all the Coraline promotion is working. Two weeks ago it was ranking very low on the list of films that that group wanted to see. Over the last few days it's spiralled up. It's hard to promote a film that's as much for adults as it is for kids, easy for something like this to bomb -- or to be perceived as having bombed, which is not the same thing. The advertising is out there for another couple of weeks, and it'll probably get more pervasive as we get closer to the 6th of February, and will not please your friends. And the run up to Coraline will take over this blog more or less completely, I expect, because it's all I'll be doing. And then, after Feb 6th, it will all trail off, and the advertising will die away completely, and it will fade from the blog with occasional splashes of mention if the film does something interesting, or if I go somewhere to help promote it. I read This Blog of Cheryl Morgan's. Thought "That's bizarre. I mean no-one would actually DO that." Then read around and realised that, yes, there are people who are interpreting the laws to get lead out of products aimed at children as meaning that they have to be kept away from book, with all that printing in it. It's mad and silly, but here's an American Library Association letter explaining that, yes, it's true, and what you can do about it. 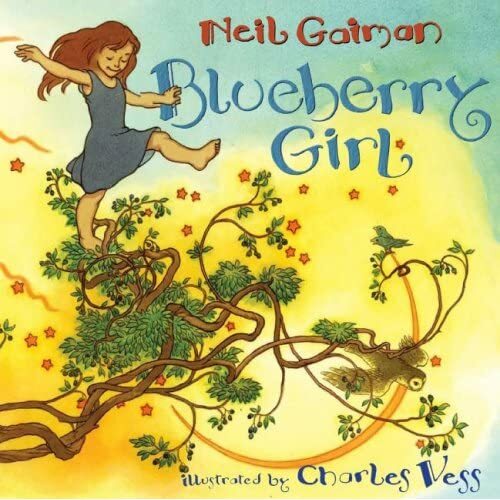 The only Blueberry Girl event will be on Saturday March 7th, at Books of Wonder in New York. Me and Charles Vess, signing books for anyone who comes by, along with a display of the original paintings, a Q&A, and so on. If you're in New York, we'd love to see you -- more details as I get them. And the next post will probably be all coffee. You lot are amazing. http://www.guardian.co.uk/books/2009/jan/22/1000-novels-fiction-fantasy-introduction Is the introduction page to the Guardian's list of SF, Horror and Fantasy novels that you should read, along with mini-articles recommending other books by Roz Kaveney, Mike Moorcock, Susanna Clarke and others. It's a great list -- and you can have fun arguing over who shouldn't be on it and who was left out. Labels: Advertising and its drawbacks, Blueberry Girl, Coraline movie, Dublin, Yes you could use the internet to figure out who I'm appearing with in Ireland but really now wouldn't that be cheating?